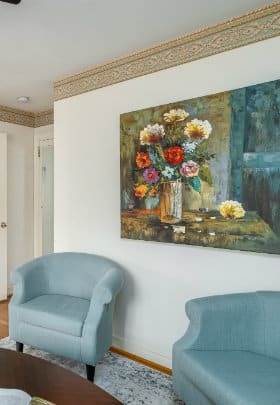 The atmosphere of the largest two-room suite at Colonial Gardens Bed & Breakfast provides an intimate rendezvous spot for your honeymoon or romantic getaway in Williamsburg, Virginia. With its welcoming sitting room, spacious main bedroom and large en-suite bathroom with tub and shower combination, you may not want to leave this opulent suite. The beautiful main bedroom is richly appointed with a king-sized, four-poster canopy bed. Its rich, fine linens have of course been hand-ironed for your comfort. The large, masculine furniture set against the richness of the silk drapery and delicate linens makes for a truly luxurious setting for a much-needed weekend away or romantic rendezvous. 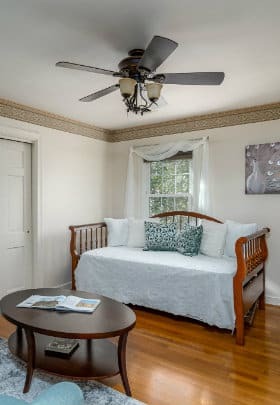 The fireplace, flat-screen TV with DVD player, and music system help make this suite a true retreat.Traveling with friends to Williamsburg? This suite is also perfect for a girlfriends’ getaway. The private sitting room can double as a 2nd bedroom with the twin-size day bed, which can accommodate up to 2 additional people. Room Rate: $195 Week nights, $205 weekends.